The damage mechanisms are similar no matter where the light is absorbed. The basic types of damage are thermal burns, photochemical reactions, and acoustic shock. The last mechanism, acoustic shock, is caused by high-intensity short-pulse lasers when the laser light causes a sudden vaporization of tissue which then causes a shock wave to spread, tearing other tissues in the eye. 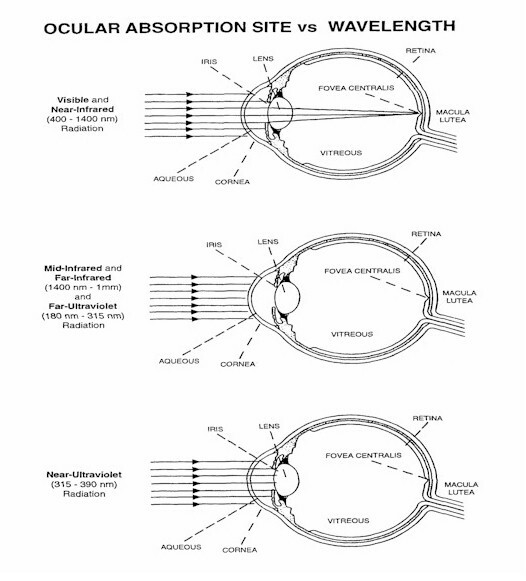 Photochemical reactions either cause cloudiness in eye tissues or a loss of light sensitivity. Near UV light that is absorbed in the lens changes proteins there causing them to become cloudy (cataracts) which blurs and dims vision. Blue light which is focused on the retina can also induce a photochemical reaction which causes the light receptors in the eye to loose sensitivity. This is known as photo bleaching and mostly effects blue color vision. Long exposure to bright sunlight can cause this type of vision loss. Infrared and far UV light that is absorbed in the cornea produces an effect called photo keratitis, which can be an irritation to the eye that causes pain and watering in the eye, or it can cause some pigmentation to occur in the cornea (welder’s flash) in the case of UV light. The effect is similar to cataracts. Injuries to the outer parts of the eye or tearing of the eye’s back wall can be corrected by surgery (and with contact lenses.) Photo bleaching or thermal burns to the retina cannot be healed and result in permanent loss of vision. Always inspect glasses for damage before wearing them. Also keep in mind that glasses can themselves be damaged by the laser exposure and loose some of their protective capacity if the power of the laser is above their damage threshold. Interlock control at the KLS entrance. The interlocked door is the innermost door of an air lock that helps to maintain constant temperature in the KLS for laser stability. The outer door of the air lock is shown below along side the laser goggle storage. To bypass the interlock, you push the black button at the bottom of the box. Different safety goggles are needed inside the KLS depending on what machines are in use. 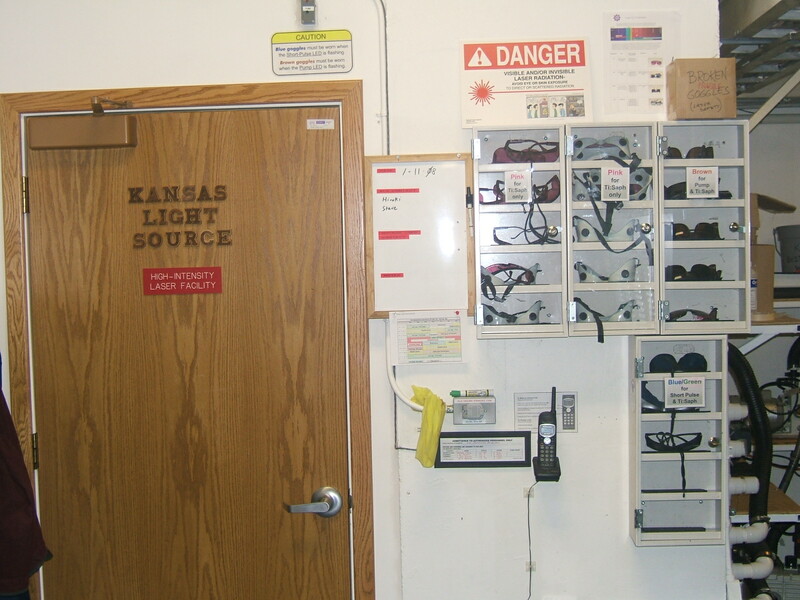 The goggles are kept sorted in the storage cabinets outside the lab so that users can easily get the appropriate eye protection. 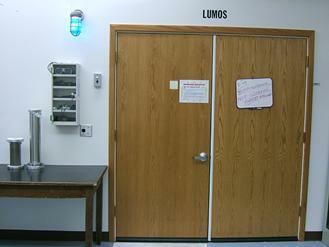 You can use the phone on the wall to call into the lab to talk to someone inside. The button to the left of the phone rings a door bell if you need someone to come out to assist you. 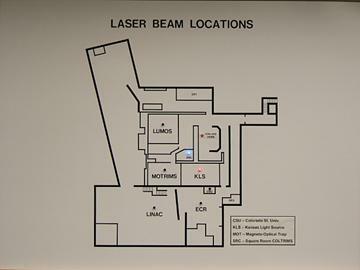 The lights tell you if special conditions exist inside the laser lab. 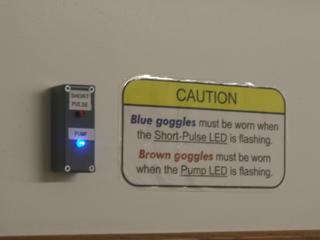 The blue lamp shown lit indicates that users need to wear brown goggles because the pump laser is uncovered. If the red light is on, then short pulses are being generated which require the use of the blue goggles. When both lamps are off the pink goggles may be used. 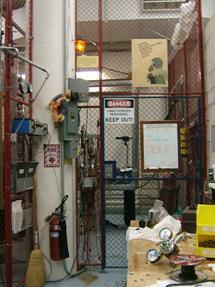 When a lab user comes to a closed control gate, it is the users responsibility to know what hazard is beyond the gate. 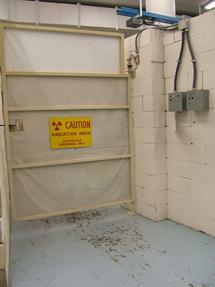 If the hazard in the controlled area is penetrating radiation, then you should not enter the area. 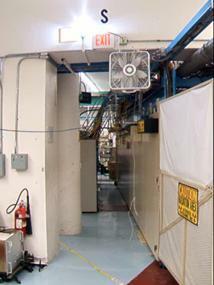 You will need to contact the accelerator operator and find out when the experiment can be conveniently interrupted so that the radiation source can be shut off and you can gain safe access to the area. 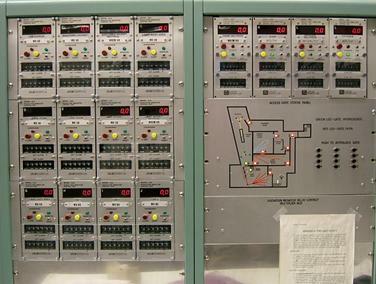 To determine if penetrating radiation is present in a lab area, you can check the area radiation monitors in the control room. 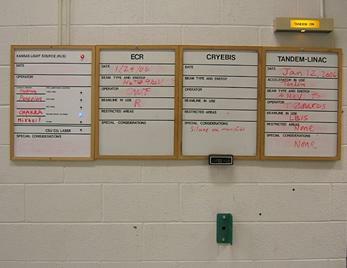 The panel shows the radiation dose rate at each of the monitoring stations around the lab. There is also a map to show you where each station is located. The map also shows the locations of the control gates. 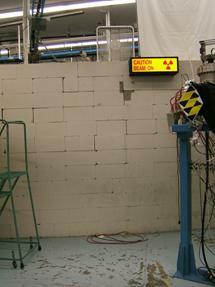 A red LED in a gate location indicates that there is no radiation interlock active on that gate. 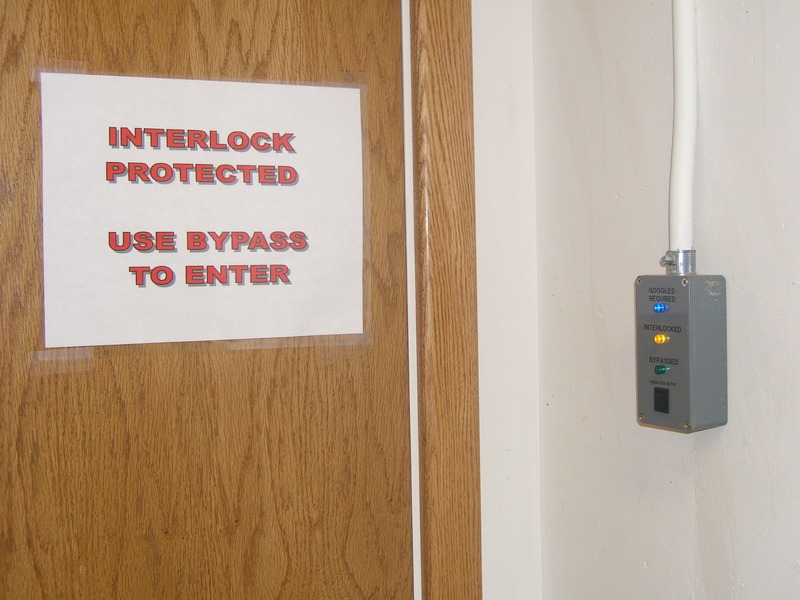 If the LED is green in color, then the interlock as been set so that opening the gate will shut down the system. You should not open a gate with a green LED without first informing the person running the experiment. 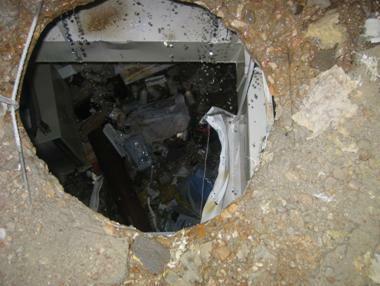 a) Cylinders should be secured to a wall or other structure so that they cannot fall over. b) A cylinder that is not in use should have the regulator removed and the safety cap installed over the valve. c) If a cylinder is empty, it should have a ring put over the safety cap to mark it as empty or be removed from the lab. a) Always remove the regulator and install a safety cap before moving a gas cylinder. b) Transport a cylinder on a four-wheeled cylinder cart with the chain secured so that the cylinder cannot fall off the cart. a) Always secure the cylinder to a wall bracket or other support structure before removing the safety cap. b) Check that the regulator sealing surface and the connector threads are clean and undamaged. If a gasket is needed, make sure it is in good condition. Make sure the regulator is appropriate for the gas you are using. c) Tighten the regulator to the cylinder using a wrench. Most cylinder nuts are 1 1/8 inch size. There are box wrenches in the lab for this size, or you can use an adjustable wrench. Most nuts tighten by turning the nut clockwise when looking from the regulator towards the cylinder. Left-hand nuts are marked with a grove around their middle, and tighten the other way. d) Check that the connections to the gas line going to the regulator are not damaged and attach the gas line. 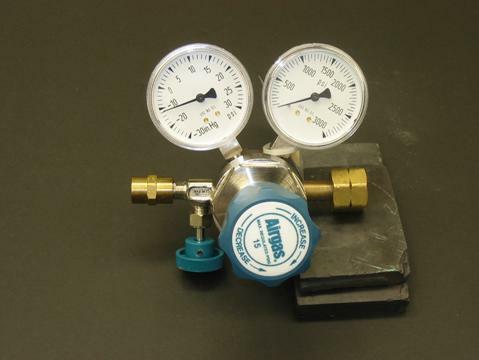 e) The procedure for purging air from the regulator and delivery line will depend on the type of gas and the regulator. i) Some regulators are tagged as being “for vacuum service”. With these regulators, the whole gas delivery system can be pumped out all the way to the cylinder valve. iii) If the gas is toxic, it cannot be purged into the lab. Contact lab technical staff in this case. f) Check for leaks in the system after all connections are tightened. This is usually done by opening the valve on top of the cylinder to pressurize the regulator. Then the cylinder valve is closed, and the pressure in the regulator is monitored to see if it leaks down. 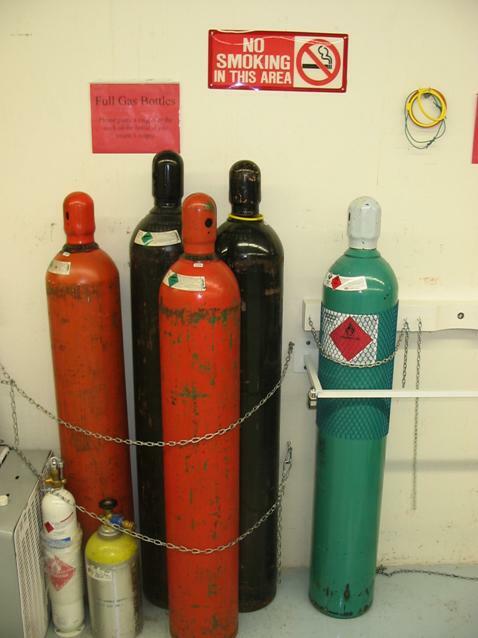 If the gas is toxic, have lab technical staff install and check the gas bottle. a) Before opening the valve on a gas cylinder, always make sure that the regulator is shut off. To do this turn the handle in the center of the regulator bonnet fully counter clockwise, either until it stops or until all spring tension on the shaft is released. b) Open the valve on the cylinder slowly by turning it counter clockwise. Watch the pressure gauge on the inlet side of the regulator to know when the valve is open. c) Set the desired operating pressure coming out of the regulator by turning the regulator control clockwise while watching the output pressure gauge. d) When you are finished with your experiment, close the valve on the gas cylinder and turn the regulator pressure control fully counter clockwise. a) Be sure the valve on the cylinder is closed (clockwise) and that the regulator pressure control is set at its minimum (counter clockwise). b) If the gas is toxic, it must be purged from the regulator and lines before anything can be opened to air. Contact lab technical staff for help. c) Remove the delivery line from the regulator. d) Remove the regulator from the gas bottle. Generally this is done by turning the nut on the regulator adapter counter clockwise. Some regulators have left had threads on them. These are marked by a grove around the flats of the nut. Turn left-hand nuts clockwise to loosen them. e) Screw the safety cap onto the cylinder. If the cylinder is empty, place a ring over the safety cap. 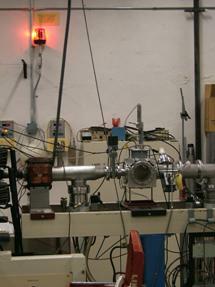 These cylinders are all in use at the diode source. 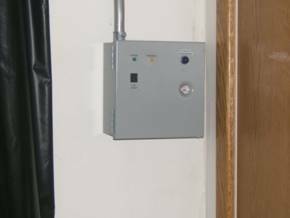 The regulators work the same way irrespective of the type of gas they are installed on. Turning the handle in the center of the regulator bonnet clockwise will increase the pressure of the gas delivered to the output line. The pressure control should always be turned fully counter clockwise before the valve to the cylinder is opened. It is also recommended when you finish an experimental run, that you shut off the regulator by backing out the pressure control counter clockwise. 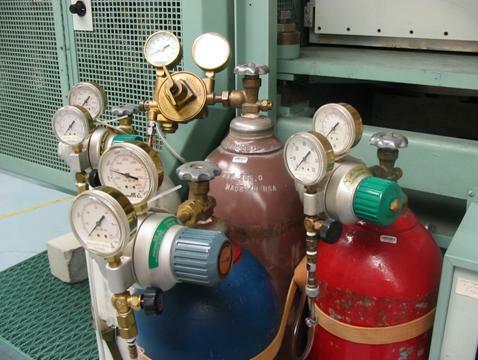 Different kinds of gases have different fittings at the cylinder valves where the regulator screws on. The nut on the regulator shown to the left has left hand threads, as indicated by the notch made around the nut flats. To remove such a regulator from a gas cylinder, you must turn the nut clockwise when you are looking from the regulator towards the cylinder.